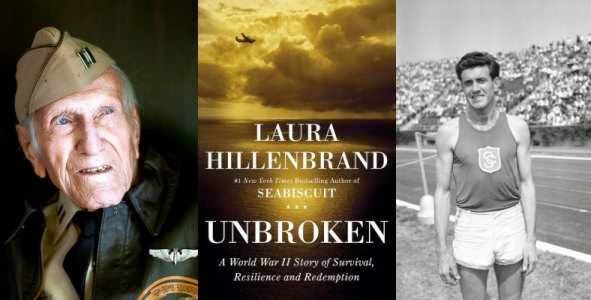 Last week, I watched "Unbroken," a powerful movie based on the book by Laura Hillenbrand which describes the life of the WWII hero, Louis Zamperini. This man survived storms, scorching heat, hunger and thirst for 47 days on the open seas. Captured by the Japanese at the height of WWII, he endured ridicule and shame. He was tortured and humiliated by his cruel captors. His body was physically broken. Emotionally spent, the easiest thing for him was to give in to the demands of his captors or to simply die. No. Zamperini chose life and endured all things. The Japanese leader, Mutsuhiro "Bird" Watanabe, in the prison camp tried to break Zamperini, but failed to crush the spirit of his prisoner. In fact, Watanabe was instead broken from the inside out. All because Zamperini chooses to persevere regardless of the hardship and torture inflicted upon his flesh. It reminds me of Jesus' words, " Do not be afraid of those who kill the body but cannot kill the soul. Rather, be afraid of the One who can destroy both soul and body in hell" (Matthew 10:28). It's amazing how Zamperini did it. Anyone would have given up and chosen the path of death. Personally, after watching the movie, I see three reasons for Zamperini's persevering spirit. The first is of course his training. Growing up in a tough neighbourhood where he was constantly being picked upon and bullied, he cultivated a resilience that never say "ouch or cry." With the help of his friend, Pete, he trained as a runner for his High School team and eventually became an Olympic runner. There is something very special about running and the Christian race. For running requires discipline, pacing, and a sense of purpose. Good runners will know how to estimate the distance, aware of the terrain, sensitive about the shoes to wear, how much water to consumer, and personal timing of each running stage. Above all, they persevere. The second reason is a sense of pride for what he believes in. This is seen most evidently when he was picked from among the prisoners to go to a Tokyo radio station. His first message was a personal one to his parents. After eating good food in a nice restaurant, he soon found out that there was a price to pay for such luxury. All he had to do was to read propaganda material for the Japanese. He refused to be a pawn for the Japanese. As a result, instead of comfort and luxury, he was sent back to the prison camp for further punishment. The third reason I believe is his inner faith. Although it was not explicitly spelt out in the book, the references to it tend to be more subtle. Right from the start of the film, there was a preacher that speaks from the Bible the essence of faith. "God created two great lights. The greater light is over the day. The lesser light is over the night…You must live through the night. Don’t battle with it…God sent Jesus to forgive sin. Accept darkness. Live through the night. Love thine enemy." "A moment of pain is worth a lifetime of glory." "However dark the night, however dim our hopes, the light will always follow darkness." "After years of severe post-traumatic stress, Louie made good on his promise to serve God, a decision he credited with saving his life." "Motivated by his faith, Louie came to see that the way forward was not revenge, but forgiveness." If you like more quotes, you can check out some leadership tips from this site, and other memorable movie moments here. The point is, Zamperini's faith is the single biggest defining factor of his life. It is that one thing that exemplifies his life: Enduring Perseverance. If hope is the overall frame of the skeleton, perseverance adds in the flesh. The root of perseverance is in Christ. Pate sees a chiasm in Romans 5:2-4 suggesting that "hope is conditioned on suffering." Note how hope and suffering are tied together. Suffering tests the real hope we have. Remember Paul teaching us to share in the fellowship of Christ's suffering? If you are familiar with Calvinism, you will know that the last of the five points of Calvinism (TULIP) is "Perseverance of the Saints." This absolute assurance spearheads the believer to be the witness for Christ through both thick and thin, to withstand all challenges. This is the motivation for perseverance. Moo points out his own stand as a Calvinist that even as he believes in the perseverance of the saints, he believes equally that "it is the saints who will persevere." This is an important point, for the Calvinist concept of "perseverance of the saints" can easily be bottled up as a good idea or a classroom doctrine to know. When we talk "saints who will persevere," we release this truth to real life. The justification by faith is made alive through saints who persevere on through life because they know nothing can take that away from them. There is another way to look at the word "persevere." The prefix "per" means "through" or "by means of." The word "severe" represents tough times in life. Put the two together, "persevere" is symbolic for going through tough times. Though this is not a formal etymological exercise, this carries the spirit of Romans 5:1-5. It is only in the appreciation of the confession of Christ, that we can move on to the next levels of embracing hope, enduring tribulations, and exercising perseverance. Without the conviction of the words of Christ, what hope will there be? Without the consolation of God's sovereignty, why glory in our sufferings? 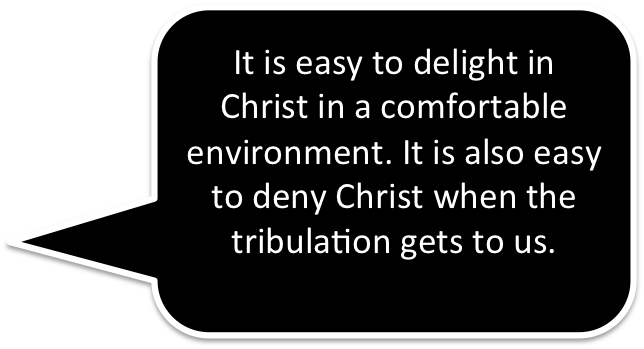 Without the conviction that the gospel is worth it, why persevere? The key to a sustained race through the Christian life is to let the peace of God through Jesus Christ feed, fuel, and fill our beings for the entire journey from beginning to end. This is the key to stay unbroken.